What was the layout of the Motte section of the Castle? What was the layout of the Motte and Tower section of the Castle? What was the layout of the Bailey section of the Castle? The Norman Motte and Bailey castle layout was a highly practical design which was a perfect base for controlling the native English population. William the Conqueror employed a strategy of quickly building a network of wooden Motte and Bailey Castles. 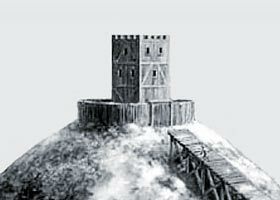 The timber-built Motte and Bailey Castle could not be viewed as a permanent castle as the wood built on earth rotted quickly and they could easily be destroyed by fire. But they were of great temporary value! As many as 1000 Motte and Bailey castles were built in England by the Normans. The process of excavating the earth to build the massive mound, which was the motte, and the shallower mound created a highly convenient defensive ditch at the base of the motte and surrounding the whole of the bailey! On the top of the Palisades were 'Crenellations' form which the soldiers fired arrows. All the time they would be bombarded with arrows and other missiles! Filling such a ditch with water was sometimes impractical and in this situation the ditch was filled with spikes and other obstacles! The Norman Motte and Bailey castle layout was a highly practical design which was a perfect base for controlling the native English population. The scenes illustrated on the Bayeux tapestry, celebrating the Norman victory at the Battle of Hastings, and the eye witness accounts of the chroniclers has provided us with a vast amount of information about the Motte and Bailey castle layout.